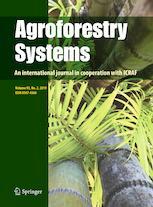 Agroforestry Systems is an international scientific journal that publishes results of novel, high impact original research, critical reviews and short communications on any aspect of agroforestry. The journal particularly encourages contributions that demonstrate the role of agroforestry in providing commodity as well non-commodity benefits such as ecosystem services. Papers dealing with both biophysical and socioeconomic aspects are welcome. These include results of investigations of a fundamental or applied nature dealing with integrated systems involving trees and crops and/or livestock. Manuscripts that are purely descriptive in nature or confirmatory in nature of well-established findings, and with limited international scope are discouraged. To be acceptable for publication, the information presented must be relevant to a context wider than the specific location where the study was undertaken, and provide new insight or make a significant contribution to the agroforestry knowledge base.